Ado-be-Gone #6 – A happy accident. So, with this edition of my "Ado-be-Gone" you will realise it's rather similar to the previous one; as they both use flour. But with this one it was a complete accident. The other week I bought some card letter-forms from hobbycraft as I liked the 'sort of helvetica' shape there are, as they were obviously modelled on a font, but made very sloppily and had now created a new sans serif of poor structure. I also bought them because are made from flammable material, so I could burn them in order to make a flame engulfed profanity! As I arranged the letters in the kitchen on our huge chopping board, I opened the cupboard in the hope to find some sweets (which I unconsciously knew weren't there) and I accidentally knocked Gabriella's flour from the cupboard and it fell over my letters. I realise after a second of panic that I will have a cool negative typography layout on the chopping board, so I sprinkled a tad more down to raise definition of the letters and grabbed my camera. Ironically, the words I was spelling out, is exactly what I said when I say 1kg of self-raising flour fell at me. I hope you are loving the terrible grammar in the title of this post, because I've been listening to Hip Hop, non-stop for the past few days and it had to make it into my blog at some point. 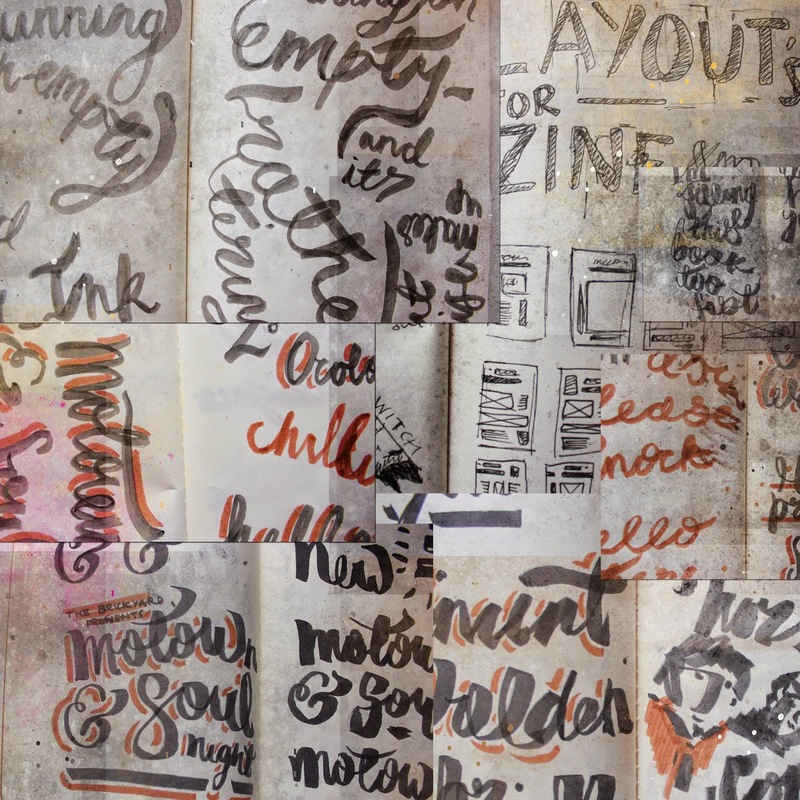 Over these holidays – which seems to be lasting forever – I've been keeping myself as busy as possible for two reasons, to improve and to avoid the ailment known as 'netflixitus', so as every good designer would, I attacked my sketchbook with my pens as often as possible. I featured this double spread because it's the only one with completely legible text upon it, and I quite like the blackletter font I was working on, on the right hand side. Wait, a blackletter style font in brown? FONTCEPTION! But this is where my third Moleskine sits currently. A half empty double spread with a brush script style that I working on mastering, with a very true quote "I'm filling this book too fast" which wouldn't be an issue if I wasn't a Moleskine fanboy, and they aren't cheap. Anyway, I'm having a nice holiday (even if it's seeming too long) and I've kept myself busy with posters, self-initiated things, zines and my sketchbooks. I hope you are having a nice time too, and if you are a course buddy, see you soon! Motown & Soul strikes again! Once again I've done the poster for Carlisle's premium Motown & Soul evening, and this time I think it looks even better than the rest. This time I realised I hadn't thrown enough Women into the mix – which I really should of – because they were the absolute shining star of the Motown movement. So I couldn't of picked a better image to use. Of course, I got a brilliant and beautiful image of the Supremes, who are arguably the most famous and successful act to record under the Motown label. To start the poster, I altered the image with a blue colour overlay; which added a little style and removed it from being the original raw image which is so famous that it would distract from the poster itself, due to it's recognition from fame. I then decided to start to distress the image, to make it look like the age the image should be, which really worked and added to the style I wanted to portray. I followed a similar style of typography structure for this poster as the previous to make it link in and hopefully create a brand or running theme. You already know what else I'm likely to babble on about, so I'll show you the poster and save myself the hassle. 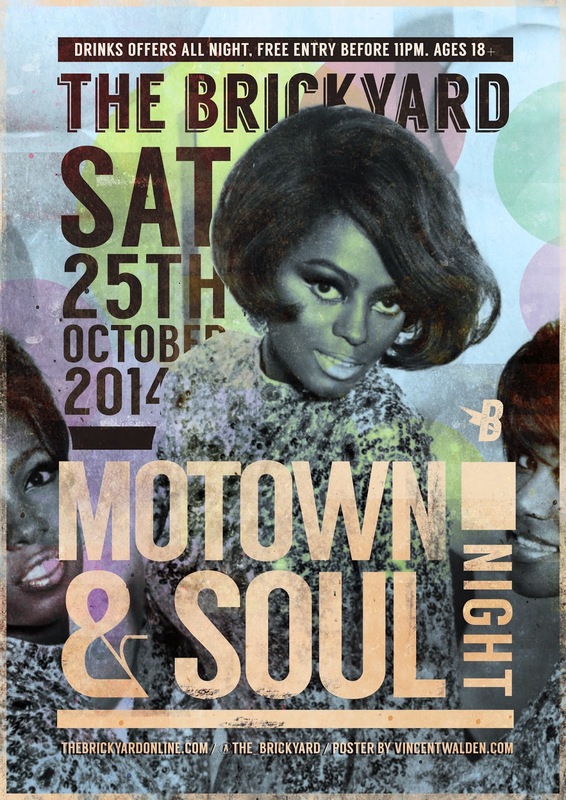 Anyway, if you live under a rock or are stupid enough not to look at my posters, there is a Motown & Soul night being hosted at The Brickyard regularly and you should be there, because there is very little music better than this out there. True fact. Any critique would be very much appreciated. Second edition to the glyphs posters – and this time I've been a good post-modernist, looking very closely at Russian Constructivism for my main structural content. I decided to tackle the one glyphs that I knew very little about, but knew when I saw it being used incorrectly. 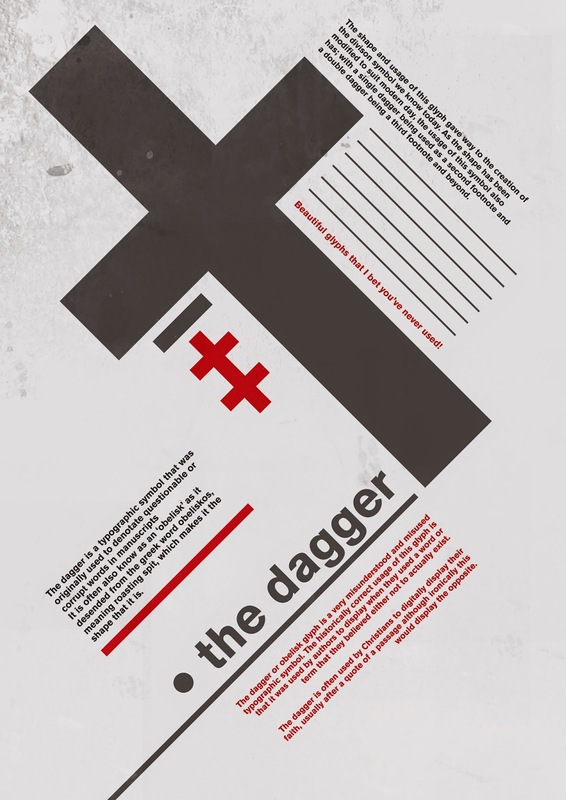 I have seen many people use the 'dagger symbol' as a Christian cross and it it's lowest the 'double dagger' be used as a replacement for the Yen currency symbol. Whilst designing I stuck to using Akzidenz Grotesque as I felt it matched the style of not only Lizzitsky and Rodchenko but the whole style of the movement. I went traditional black and red, just to relate even more to the style. The sharp bold edges with straight lines really worked well with the diagonals and strong anchor points that Constructivism often holds; even if my poster contains about 400% more text than the originals. I would say Rodchenko would be proud, but I highly doubt it. All of about two hours ago I had an idea when day dreaming of one of my favourite glyphs. I was thinking about how nice it looked but I honestly had no idea what it's used for, or even how to access it on my PC keyboard. § – You may recognise this symbol if you've ever used a mac, as it was about the very first thing I did on one. You find yourself endlessly spawning this strange 's' all over your work because it looks nothing like what you've used in your 20 years of life. 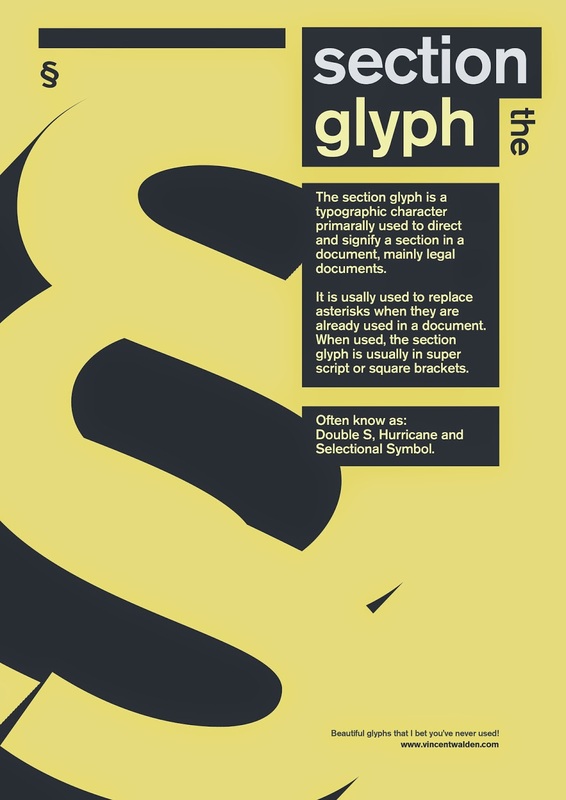 The symbol shown is the "section sign" or "section glyph" and until a few hours ago, I thought it was lovely but had no idea what it was used for. So if you find yourself in this predicament of keyboard spamming on your trusty mac, I hope this little poster will help you understand what that wicked cool 's' actually is. For the style, I used a starting point of my current favourite colour PANTONE P 1-14 C or to anyone outside of the design world of colour obsession; yellow. When I saw the harsh faded black, I instantly thought of The Haçienda branding and it just took me from there. I will continue this like an over excited school boy in a sweet shop, so stay tuned. A new member of the Clan! A very short post, but I feel it is necessary. Say hello to Yuki, the newest member of our Family. This is her favourite place to hide and sleep. And now she looks pretty proud of her hiding place. As you have noticed, she's below our slowly growing collection of Ghibli DVD's. If you know you're Ghibli trivia well, you'll realise she's named after a character in The Cat Returns. Like our other cat, Haru. Yeah, we are pretty sad and this has nothing to do with design.